The words “tomato soup” usually conjure the image of gloppy condensed tomato goo slopping out from a can. Sure, serve the shelf-stable stuff with grilled cheese and you have a nostalgia-invoking comfort meal. Admit, though, that the tinny-tasting soup plays a minor role supporting the true star: the gooey cheese. Stop eating crummy canned tomato soup. It’s a crime against tomatoes—especially fresh tomatoes, which you can score right now in abundance. Take a few ripe heirlooms, toss them in a blender with garlic, basil, vinegar, and olive oil. Buzz everything up, strain out the seeds, and then put the strained soup in the fridge. Once it’s chilled, pop a simple crab salad on top, and you’ve just discover that tomato soup can taste, well, pretty damn good. “Should you choose to skip the soup, the crab salad is delicious on its own,” say the recipe’s creators, Chris Phelps and Zak Walters, chefs/co-owners of Salt’s Cure in Los Angeles. But, really, don’t skip the soup. 1. In a blender or food processor, puree the tomatoes, garlic, basil, and salt, to taste, until smooth. Slowly drizzle in half the olive oil and continue to process until all the oil is incorporated. Strain the mixture into a bowl through a fine mesh sieve. Season with salt, if needed, and refrigerate until cold. 2. In a medium bowl, combine the shallot and lemon juice. Slowly drizzle in the remaining olive oil, whisking until well combined. 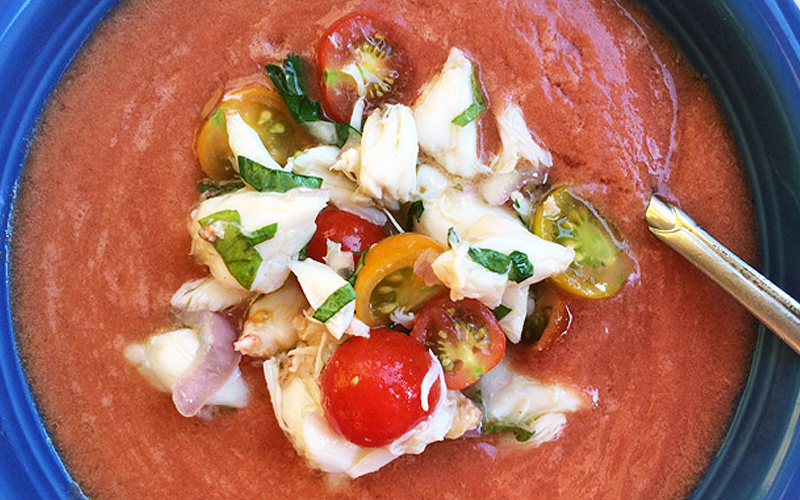 Add the crab, tomatoes, and basil, and mix everything together with your hands. Season with salt. 3. To serve, pour the soup into 4 bowls and top with crab salad. Maria’s Five Favorites: Getting Ready for Autumn! This soup is fantastic! I just made it last night. Super easy – by the way, add the vinegar to the soup (not to the salad). OMG! the raves are still coming.